We agree that it would be terribly weird. D: That's why we offer baby Neopets as a colour, just like any other paint brush. Check out the Hidden Tower if you're interested. 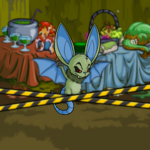 That way everyone can enjoy adorable baby Neopets without the weird parts. We don't think our numbers are quite out of hand enough to warrant dropping zeros from everything. It sounds like a lot of mess for not really fixing much. Those items with basically no value would still be worthless, and we think everyone would have a rough time adjusting to the change. Yes, items with a rarity of one through 100 can stock in Neopian stores. Rarity 99 items like Thyora's Tear restock very rarely, and Rarity 100 items like the Glittery Scorchstone are all but non-existent. Shhh! The Emerald Eyrie Coin and I are hiding. D: That's, uh... quite a name. Glad you liked it. ;D The Neopets that got stuck in the Pound while it was down are still being released into Neopia, and as we mentioned some Editorials back, an unused account purge is scheduled in the not-terribly-distant future, which will free up quality names like __t4_happy_dance_201b! In order for your shop to appear in the Marketplace, you need to keep upgrading your shop until it is large enough in shop size to appear on the map. If you mean more along the line of the graphics and links you often see in those shops, those are groups of players working cooperatively by linking their shops to form a "mall." If you have the funds or shop size to appear in the Marketplace, you can contact the players from your favourite mall to see if they have an opening. It's totally up to them, though. We have nothing to do with these "malls" and cannot force them to let you play along with them. Odd... we'll look into that and see if we can fix it. Thanks! One must wonder... do fire Antwerphs eat fire ants? Originally it was our intent for the Kadoatery to randomly (and rarely) award a Kadoatie, but if we remember correctly we decided against it, although afterward we mentioned it in the Editorial. (This is all based off of some very rusty memories, forgive us.) Please remember that the information we offer in Editorials is what we believe to be the most accurate information at the time. This means, however, that sometimes things unexpectedly change or just develop as the site ages (or, heck, sometimes we just plain mess up and are wrong about something). Aside from Lawyerbot, we're all human here and can only do our best. Urf, we'll look into that and figure out what the issue is. It's probably Meepits, judging by our past history. They get into everything. We expect you'll be seeing some new Cybunny colours during the upcoming carnival. 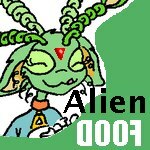 Usually we only release Neopet colours on their Neopet day, or related holidays such as Halloween or Christmas, or other special event days where a paint brush makes sense.